Intelimer Adhesive Tape, Industrial wiper and Molded rubber Products. 2-1, INDUSTRIAL 2ND RD, PINCHEN INDUSTRIAL PARK. TAOYUAN 324. TAIWAN. R.O.C. TAIWAN NITTA as a member of NITTA Group, every employee should implement integrity in their action. We aim to meet customers’ requirement swiftly, and satisfy customers by providing excellent technology and high quality service. 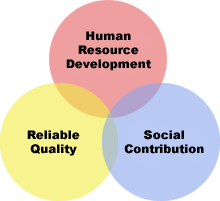 To make each product excellent, every employee must put continuous quality improvement in practice. Nitta started operations in 1885 in Osaka. The founder's goal was "to manufacture with our own hands products that cannot be available in Japan." After many years, this same concept still defines the businesses of Nitta. Our mission is to capture leading market suppliers based on the spirit of "Invention & Innovation." The Nitta Group remains dedicate to achieving more growth and progress on a global scale. "スゴイコトニクス" (Japanese in English Sugoikotonics)To us, technology is not everything. Ideas which we create may be an amalgamation of nature, culture and technology - a complex combination of creative elements. That is how we work in this new era of creativity. What shall we call it? Perhaps, "Sugoikotonics"?